Founders: Eugene McDermott, Cecil Green, Erik Jonsson & Patrick Haggerty. Specialty: Invented first integrated circuit, world's first commercial silicon transistor. Designed and manufactured the first transistor radio. Manufactured first commercial calculator, Third largest manufacturer of semiconductors, second largest supplier of chips for cell phones, largest producer of digital signal processors (DSPs) and analog semiconductors. Leading manufacturer of consumer and military electronics including calculators, micro-controllers and multi-core processors. Creator of the classic Ti-99/4a home computer and Speak & Spell toys in the 1970/80s. 1930 - Company formed as Geophysical Service (GSI). 1946 - GSI forms it's electronic lab & manufacturing unit. 1951 - Company name changed to Texas Instruments (TI) from GSI. 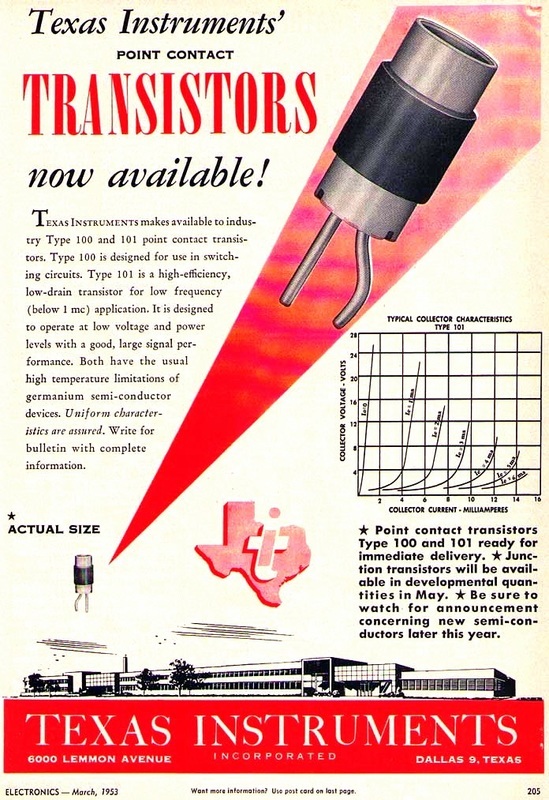 1952 - TI enters the semiconductor business buying transistor license from Western Electric. 1953 - Semiconductor Product Division is created. 1954 - First Germanium High-Frequency transistors produced. 1954 - First commercial mass-produced transistor - grown-junction silicon transistor. 1954 - First commercial mass-produced transistor product - Regency TR-1 Transistor Radio. 1958 - TI's Jack Kilby invents the Integrated Circuit. 1958 - Explorer, first U.S. orbiting satellite, the "Explorer" uses TI transistors. 1958 - Develops Diffused-base transistor manufacturing process. 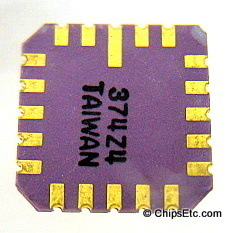 1959 - First commercial integrated circuit introduced – TI's "Solid Circuits". 1959 - First Gallium Arsenide (GaAs) solar cells. 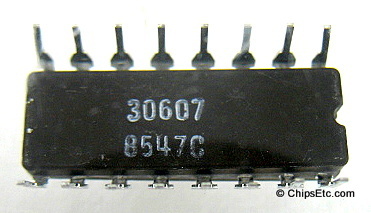 1961 - First digital logic Integrated Circuit family introduced - Series 51 ICs. 1961 - Epitaxial and Planar Semiconductor manufacturing processes implemented. 1961 - TI military IC's manufactured for use in U.S. Polaris Missile. 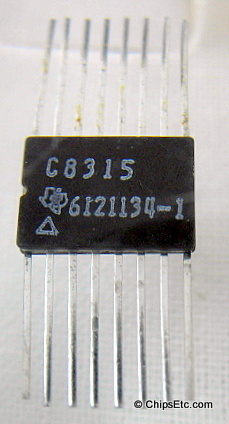 1962 - Series 52 IC family introduced. 1964 - First plastic packaging of integrated circuits. 1964 - First use of a TI IC in consumer device - Zenith hearing aid. 1968 - TI’s first Metal-On-Silicon (MOS) circuits produced. 1969 - Jack Kilby awarded National Medal of Science for the Integrated Circuit. 1969 - APOLLO Lunar Exploration Module uses TI ICs. 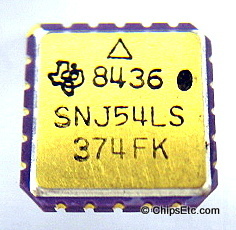 1969 - Large Scale Integration (LSI) IC designs introduced. 1969 - Memory arrays developed. 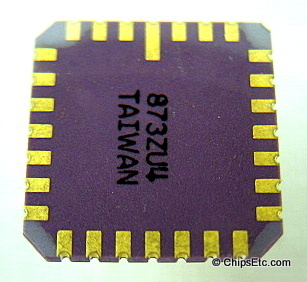 1971 - Single-chip microprocessor invented. 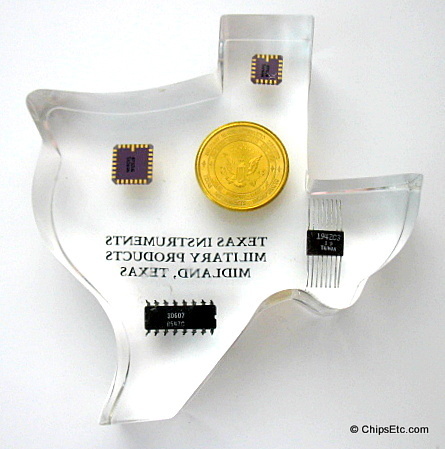 1971 - Single-chip “calculator on chip” invented (micro-controller). 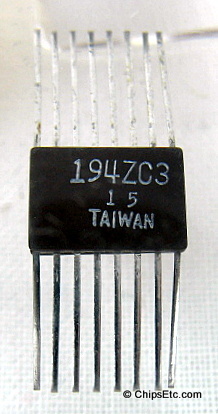 1971 - Series 54/74 Logic family of ICs introduced. 1973 - 4K dynamic random access memory (DRAM) IC developed. 1974 - TMS1000 single-chip microcomputer (micro-controller) introduced. 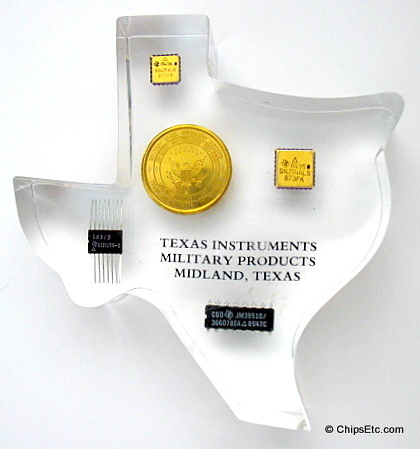 Texas Instruments High-Reliability Military Products of Midland TX Computer Chip Lucite paperweight. This is a promotional / award paperweight. Reads "Texas Instruments Military Products Midland Texas". 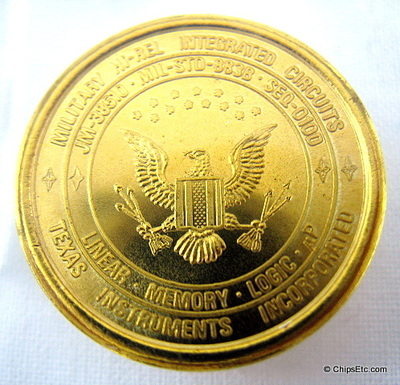 There is a gold colored coin with an eagle on it. The coin reads (on both sides) - "Military Hi-Rel Integrated Circuits. 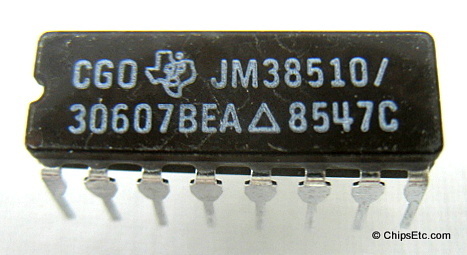 JM-38510 MIL-STD 883B SEQ-010D Linear Memory Logic. Texas Instruments incorporated". 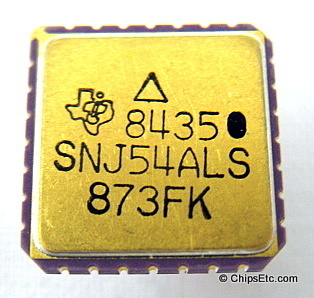 TI Military Chips include the JM38510 Operational Amplifier in 16 lead plastic DIP packaging, one each of SNJ54ALS & SNJ54LS Logic Chips in gold quad flat packaging, and a 6121134-1 Buck Regulator in a16 lead SOP plastic package.